The fantastic semantic dance that is the official story of Ingrid Betancourt's rescue from the FARC (Revolutionary Armed Forces of Colombia) positions Colombia's government in a celebratory light, with the U.S. sharing the spotlight. To gauge the success of the storyline, one has only to look at the movie that is supposedly in the works by Colombian director Simon Brand and Hollywood producers. Nevertheless, almost immediately after the first story broke, other versions and commentaries emerged, unconvinced by the plot's twists and turns and skeptical of the character development. Numerous articles have sought to unravel the threads of politics, sensationalism, and truth. Two days after the "rescue," The Times Online blatantly asked, "Brilliant or a sham?," revealing a report that said the U.S. and Colombia paid $20m for the hostages release, and the operation was staged to cover it up. LASolidarity posted an article from Rebelion stating the FARC initiated contact with Colombian officials to release the 14 hostages. Amy Goodman of Democracy Now! details the Uribe regime's harsh policies toward Colombians, arguing that a celebration of Betancourt's release should not be confused with a celebration of the Colombian government. Goodman also points out John McCain's connection to Colombia. McCain was there the day FARC released Betancourt and the other hostages. A recent fundraising event for him was funded by the former CEO of Chiquita who once funded the notorious right-wing military group, the United Self-Defense Forces of Colombia (AUC). Furthermore, before resigning to work full-time for McCain, Charlie Black, McCain's top advisor, lobbied for Occidental Petroleum. 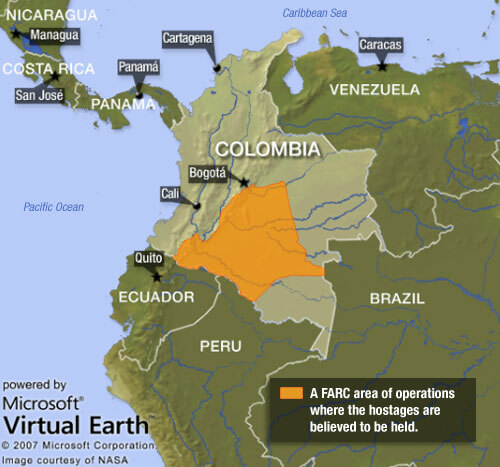 Occidental has been linked to controversial military operations in Colombia, including one in which they supplied transportation, fuel, and facilities to the military in order to bomb the village of Santa Domingo. Colombia is the third largest recipient of U.S. aid, following Israel and Egypt. nice post! I wonder if the real story will ever come out. Either way, there is certainly something going on in the public relations end of the Colombia-U.S. scheme.